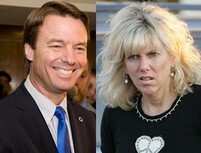 NATIONAL ENQUIRER: John Edwards Caught Visiting Mistress (Rielle Hunter) & Secret Love Child … Two Americas … Baby Daddy? Talk about your Two Americas … or it it two faces John Edwards? The story comes from The National Enquirer and that does provide some pause. However, even a blind squirrel manages to find an acorn or two every so often. A broken clock does tell the time correct twice a day and as compared to the news stories from the MSM these days … why can’t this be true? We are reminded by The Corner that it was The National Enquirer that broke the Rush Limbaugh/Oxycontin story and most stories in the O.J Simpson case. Who knew this was the Two Americas that Edwards was talking about? The National Enquirer is reporting that former Democratic VP Democratic and Barack Obama Veep candidate short lister, John Edwards has been caught visiting his mistress and love child at the Beverly Hilton on Monday night. I guess the Obama VP vetting team missed this one? The Enquirer is reporting that John Edwards met with his mistress, blonde divorcée Rielle Hunter, at the Beverly Hilton. Rielle had driven to Los Angeles from Santa Barbara with a male friend for the rendezvous with Edwards. The former senator attended a press event Monday afternoon with L.A. Mayor Antonio Villaraigosa on the topic of how to combat homelessness. But a months-long NATIONAL ENQUIRER investigation had yielded information that Rielle and Edwards, 54, had arranged to secretly meet afterward and for the ex-senator to spend some time with both his mistress and the love child who he refuses to publicly acknowledge as his own. The NATIONAL ENQUIRER broke the story of Edwards’ love child scandal last year, when Rielle was still pregnant and Edwards was still considered a strong candidate for the Democratic presidential nomination. DO NOT BELIEVE THE HIGH FLOWN RHETORIC OF POLITICIANS – ESPECIALLY WHEN IT IS HOLIER THAN THOU. THEY ARE LIKELY TO BE MASKING SOMETHING. So all this was going on as Edward’s wife was battling cancer and standing by her man. Or should we say her“Breck Girl”. Red State: ‘Mr. Poverty’, ‘Mr. Compassion’, ‘Mr. two Americas’ is BUSTED! After an hour-long interview with David Perel, Editor-in-Chief of the National Enquirer, we can now say with certainty: it was easy. The steadfast “cone of silence” placed on the story by the Mainstream Media made it easy for anyone willing to do the legwork to grab the story from a decidedly-uninterested “respectable” press. UPDATE II: Media Double Standard, Why are They Ignoring the Edwards “Love Child” Story? Former NC Senator John Edwards May Finally Admit He is the “Reille” Father of Hunter’s Child … No Duh! If this is true … GEEZ … how disgusting as his wife is battling cancer. Was she getting $5500 an hour? Perhaps Edwards got the hint from Eliot Spitzer that that is the going rate …. He cheated on Elizabeth with THAT !!!!!! Looks like Camilla, Duchess of Cornwall on a VERY bad day…..LOL…. hmmmmm…maybe more fiber would help…. I don’t think cheaters are into looks so much. If this is true, is Liz gonna stand by her man? Dang she looks just like Camilla. I believe it’s true mostly because of Edwards actions when caught in the hotel. Yes, this is algore type hypocrisy. Imagine battling cancer and yet still being willing to help your husband on the campaign trail and then he’s busy playing around with another woman. It was Edwards that put his poor wife out in front on the campaign, apparently hoping to gain a little sympathy. It was Edwards that played up the “caring husband”. What a piece of dirt. Oh and yes, she’s a piece of dirt too because she knew Edwards was married (and supposedly a Christian) and yet she allowed him to play hypocrite. And yeah, she’s UGLY. I don’t buy this. Only criminal defense attorneys have relationships with people who use aliases. Rielle Hunter and Lisa Druck are such disparate names they portend criminality. Successful lawyers RUN from that and Edwards knows to do so. Big Guy (#9) … What about Eliot Spitzer? Don’t politicians (most of whom are lawyers) do stupid things every day? Yeah….were are all the people who cover Paris and Lindsay ….. where is ET and TMZ….we want DIRT ! ! ! ! ! ! What ever happened to the good old days when liberals were simply liberals? Now they want to be libertine. Is John Edward’s private life that important ? Is this story a Republican Smear Campaign ? Politics and the media are are just brutal. Amazingly, as things were going so well for Barack Obama, all of a sudden this story hits the wire. Conspiracy or Fact ? This shouldn’t surprise anyone. Edwards has always been a greasy piece of work. Chances are pretty good this wasn’t Edwards’ first girlfriend. Where’s the proof? Where’s the pictures of the two together? Where’s the DNA match? I know Lisa Druck from Florida. Interested inquiries only! John edwards is a decitful person. During the primary I just knew he was the one to be our president. What a disappointment. God Bless His wife Elizabeth. I would hide my face in shame if I were him. johnny boys problem isnt that skank but big bubba(his cellie)who’ll be touching up his “prune” when he gets to the pen after being convicted for misappropriating those campaign funds for hush money. How’s the Breck girl doing these days? I mean, WHO’S he doing these days?